Steven Jack B.: Steve and Jill here. Jill DeWitt: What were you gonna say? Steven Jack B.: I don’t know. Steven Jack B.: Welcome to Thursday. 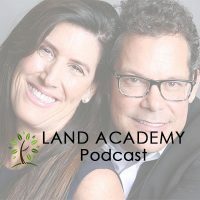 Steven Jack B.: It’s The Land Academy Show entertaining land investment talk, I’m Steven Jack Butala. Jill DeWitt: It is entertaining and I am Jill DeWitt broadcasting from sunny Southern California. 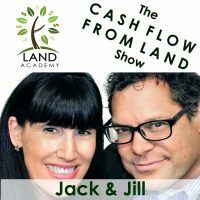 Steven Jack B.: Today Jill and I talk about how to sell a piece of land on the internet after you’ve bought it. Steven Jack B.: The bandit signs? Jill DeWitt: No, the signs that for sale property. This parcel for sale. Steven Jack B.: Oh, like on the highway, highway? Jill DeWitt: Yeah. What’s funny is, I would envision, it is low and here’s my reasoning. Because I have sold numerous properties to truck drivers, and you would think that they wouldn’t be, and I don’t have any signs on anything right, so you would think that the truck drivers are looking for the land based on the signs. If anybody’s gonna see it, it’s gonna be a truck driver and they’re gonna be buying it. Jill DeWitt: But I’ve sold a lot of land to truck drivers that, they just know the areas. Jill DeWitt: How value those signs really are, number one. Number two, have you ever noticed how old and faded those signs are? Steven Jack B.: Or 40. Steven Jack B.: Because that’s the … You know before the internet, some of that stuff’s been out there. Jill DeWitt: There you go too. So, anyway, I’m just proving my point as far as this is the way and the best place to do it. Steven Jack B.: The internet made all of this possible. Steven Jack B.: I was lucky enough to start in this business when the internet was getting its legs. Steven Jack B.: But for years and years decades and centuries, people had no way of the sell rural vacant land. 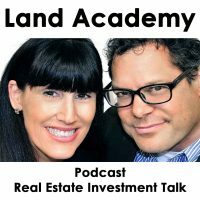 Steven Jack B.: Real estate agents didn’t want to … Before the internet, what are you gonna do, go out and look at the property? Steven Jack B.: Let’s say you’re … there’s just no way. This really created a market for vacant land. Jill DeWitt: You have to think of it like a retirement place or something. You can’t, “Sweetheart, I’ve got it all …,” could you imagine they pull out a big map? Jill DeWitt: Sweetheart I have it all mapped out. Steven Jack B.: That’s what you used to do. Jill DeWitt: Okay, we’re gonna start here in Nevada, and then I’m gonna circle around. We’re gonna check Colorado, because I found through parcels we’re gonna look at here. Steven Jack B.: Oh my God. Steven Jack B.: That’s crazy. Steven Jack B.: Stuff happens like that. Jill DeWitt: Right. We don’t need to do that anymore. Steven Jack B.: But before we get into the topic, let’s take a question posted by one of our members on thelandinvestors.com online community, it’s free. Jill DeWitt: Dustin asks, I’m just starting out with my first few deals. How do you find zoning information? I’ve already called the county on each property I’m buying. The counties I’m looking in say the same thing, “We don’t have any zoning restrictions unless it’s within city limits.” None of the properties I’m buying are within I city limits verified by the county when I asked them about specific APM’s. What do I put on my ads to market the properties for zoning? Parcel Fact list, land use, and property indicator for properties, and then a number following these items. Jill DeWitt: What do these mean? Are either one of these the zoning codes? If so, what do the numbers mean? Is there a list these numbers and they’re explanations. Steven Jack B.: This is a good question. In general, let me cover the Parcel Fact thing. What you’ll see in Parcel Fact when you pull a property is land use; 460, or the number 460. Its very, very county specific, so there’s no way without really … You’d have to call and find out what 460 is. If its blank then it gets self populated by Real Quest. The backing Parcel Fact is Real Quest Financial. It’s a massive 150 unit database, 150 million property database that pulls those API pools when you type in your stuff, so there’s no single place to go look at that. You have to call a county but, in the end you’re gonna do that anyway. If you’re gonna buy a piece of property and you need to know what the zoning is, you have to call a county. Steven Jack B.: If they say, “in this county you can do whatever you need to,” there’s no, which I have a hard time believing, even in let’s say rural Nevada, properties are zoned for single family residence, 40 acres. Steven Jack B.: In the middle of the county so, I would press a little hard in that county and maybe talk to a real estate agent in the area because everything’s zoned. Jill DeWitt: Well what do you have to do too, I find is, it’s easier instead of saying what can I do? Give them some things. Can I park an RV there? No, that’s not allowed, or yes it is allowed up to nine months out of the year or something like that. Steven Jack B.: There’s rules for everything. Jill DeWitt: They’ll have stuff on there. Steven Jack B.: There’s not do whatever you want. Jill DeWitt: Build a casino if you want to. Steven Jack B.: That’s not. Steven Jack B.: They’re just trying to get you off the phone because they want to eat some cake. Steven Jack B.: That’s what it is. Steven Jack B.: People who work in counties, eat a lot of cake. Jill DeWitt: All right Steven. Sometimes some counties you can find this information online, not a lot, but some you can and get your hands on it and dig down and see what RU whatever means and figure out the zoning. Jill DeWitt: Otherwise you do have to call. But the beautiful thing is, you’re dealing with one county. You just sent out 1500 units. Steven Jack B.: Which is 4300 feet. Jill DeWitt: Every time you see it now you know, I know exactly what all these properties do. Jill DeWitt: What you can do and what you can’t do. I know I can’t put a mobile on there. Steven Jack B.: Can I build a house? Steven Jack B.: Mobile’s the greatest ever. Jill DeWitt: They think that’s the greatest thing. That’s what you’re going for. If you can, boy highlight that in your posting so they know because that’s awesome information. Jill DeWitt: Plus if we’re buying and selling, that’s how people want to use it. Steven Jack B.: Today’s topic, how to sell a piece of property or a piece of land on the internet. This is the meat of the show. How do you sell a piece of land on the internet Jill? It’s just like on Ebay, like a trinket. Can you sell it on Amazon? What’s the deal? Steven Jack B.: No man. Jill DeWitt: I use this in, actually 1.0. I’m working on wrapping up Land Academy 1.0, which is a little bit of a refresh on some of the things from our first program. One of the things I did is I showed some screenshots in there of a good posting and a bad posting. A good posting has gorgeous photos, has a video, all the information, maybe even a description of a little bit of a little bit of, not a long one but what’s in the area. Maybe if there’s a Walmart there, how close it is to the airport, things you can do around the area, that’s a great posting. A bad posting is one that has no photos or one photo and it’s a Plat map, I see these all the time, and then it has state, county, parcel number, sales price, and a phone number. That is not a good posting and some of them don’t even have that much, you know what I’m talking about, it’s ridiculous. I showed an example of one, it wasn’t a one of, because where I was looking at these properties it’s this one seller. Steven Jack B.: That’s the norm. Jill DeWitt: It shows he has, on the left hand side of the page where I was looking, I think it was Land Watch or something or Land Farm, it shows his other listing and they’re all like that, no photo. I’m like, “[inaudible 00:10:20] how long his sit available? Who’s gonna but that?” To sell it on the internet you need awesome title. It’s gonna catch your attention right away and tell what it is. What size it is, a little bit about the size, where, what I can do with it. That’s what I want you to capture them with. Then, I want you have a really good description, and your description has got to have, I want you to have everything in there. I want you to make it so I don’t know to call you. Steven Jack B.: That’s right. Well said. Steven Jack B.: That’s the takeaway from all of this. Steven Jack B.: There should be enough information in the posting so that the buyer can go and take a look at other sources on the internet and make a decision and then click on it and buy it. Jill DeWitt: Exactly. That’s what I want. I’m gonna get to that part in a minute here too. Steven Jack B.: You nailed it Jill. Jill DeWitt: Yep. You’ll learn this too. If after you have a couple of posting out there and you realize everyone’s calling you and asking about the taxes, “Oh shucks, I should put the taxes on there.” Yes you should. You want to put in there not only if they’re current, you want to put on there what the annual taxes are. They’re gonna want to know. “Oh, it only costs $80 a year,” good to know. Not $800 a year right there. If it is, they need to know that. Steven Jack B.: Or 80,000 a month. Steven Jack B.: Like some properties we have. Jill DeWitt: Put it on there. Basically a really good description, you want to have really good photos and a lot of them. It’s very easy to go online and hire someone for $50 or $75 who’ll go out there and stand and you just send the GPS coordinates off Craigslist, literally you can do this, they’ll stand on it. Tell ’em what pictures you want, tell ’em what time of day want. Tell ’em, “I want blue sky. Make it look great shoot at the single.” There’s a lot of, especially Land Pin’s a good source to see some of our members that have done really good jobs, you can go on there and find their photos and see them. I’m not a fan of doctoring the photos, please don’t make it look it. Don’t make it look like it’s not what it is. You want it to be real, but you want to get it at its best time of day, and don’t waste snow on the ground. Steven Jack B.: And you do want to, if you have a property in Nevada, don’t shoot the Las Vegas strip. Steven Jack B.: Because you’re all working the stakes. Jill DeWitt: Exactly. That’s what you want to do. Then what you want on your site, and concerned with the posting, your number one place is on your website. Why on your website? Because on your website you should have a place for them to check out and pay, so at midnight when the wife finally is worn down and says, “Okay sweetheart, you can buy the property.” The guy can go on there, put in his credit card and buy the property and go, “Yes, I got it.” That’s why. You want it there, you want to be able to have that and then, everything else that you’re doing as far as where you’re sharing your posting all over the planet, is gonna be driving them to your website so they can check out and pay that’s the goal here. In a perfect world you want to have a 100 going at a time, maybe more, depending on what you want to do. You want to wake up in the morning and go, “Oh look at that, someone bought a property. Oh, three sold last night, that’s cool. My assistant’s going to do three deeds today, that’s the goal. Not you. You’re working on great, now I have more acquisition funds, now I’m gonna go buy this, and I’m gonna do this and this so, that’s what’s happening. But I want you to share then everywhere. Steven Jack B.: Facebook Marketplace. Jill DeWitt: Facebook. In every place. Steven Jack B.: Instagram even. Steven Jack B.: Drive all that traffic back to the website so they can click on it and buy it. Steven Jack B.: Zillow, Trulia. Steven Jack B.: It takes a ton of work out of this for you. Jill DeWitt: There’s so many, it’s like a laundry list I swear, 30 places so, get it out there, a ton of sites. Then, my last thing about this is, don’t think that, “Oh, that perfect for here, that’s perfect for here.” This is a mistake a lot of people make. “You know, I sold the last four properties like this.” But it turns out they were all sold off Craigslist so, I stopped putting it anywhere else, I just put it on Craigslist, that’s going to get you in trouble at some point. Jill DeWitt: Don’t think about it and get it posted everywhere. It’s just going to go faster and easier. Jill DeWitt: Don’t try to second guess and that so, what would you like to add? Steven Jack B.: Most people in this business, and this it true of most things in life, have the skillset that I have, or they have the skillset the Jill has. Steven Jack B.: She doesn’t want to do the data part of it, she’s just tired of it, and I don’t want to do the sales part of it because I’m tired of it. Jill DeWitt: It’s not the fun part for me. Steven Jack B.: She knows that it’s valuable. Steven Jack B.: It’s just no fun for her. Steven Jack B.: That’s well said. Jill DeWitt: In a dark room and bang it out like you love it. Steven Jack B.: I do. I love that. I live for that stuff so, if you’re starting out, you’re gonna have to do all this stuff yourself in the beginning, probably let’s say for the first 10 deals. But you need to, in the back of your head, put yourself in one of these boxes. Then hone in and get real good at it and find another person in the group. Steven Jack B.: Find another Jill or find a Steve but, become really good at one of them. I personally struggled with at the beginning of my career, my land career, bringing all these deals in, closing them, and then they just pile up because I don’t like selling them. Because I don’t like orchestrating the whole thing, so I devised this whole system on Ebay to get rid of them fast for small margins, so we never had to sell any online. It was truly out of laziness that I devised this system because I didn’t want to post it everywhere. That’s really, really, really, not good. You don’t want to be like what I did. Or you don’t want to stop sending out mail because you’re just not interested in doing the dirt. All kinds of people on the other side of whatever you are, in our group, that are matching up all the time. Steven Jack B.: People from across the country that had never met each other they’ll talk a few times on the phone and they’re partnering. Steven Jack B.: Partnering deals. I think it keeps a lot of people out of the business. One of these things keeps people out of the business or it keeps the people from in our group actually, because they just have this fear of talking to people on the phone, which Jill doesn’t have. Jill DeWitt: Yeah. It’s true. Steven Jack B.: Or the fear of pricing data, which I don’t have, so, enough said. Steven Jack B.: It’s never been easier, truly I’m not selling, there’s no sales pitch here. Steven Jack B.: It’s never been easier and more profitable to buy and sell land, ever, ever. Steven Jack B.: Well, you’ve done it again, you spent another oh, I guess, 20 minutes. Steven Jack B.: Listening to The Land Academy Show. Join us next time for Finance Friday. With me Steven, Jill, and Justin. 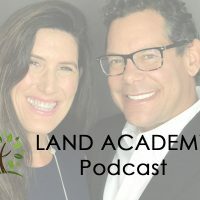 Jill DeWitt: We answer your questions posted in our online community landinvestors.com, it is free. Steven Jack B.: You are not alone in your real estate ambition. Jill DeWitt: I guess I had a lot to say. Steven Jack B.: I can’t wait to see. I can’t wait to see the numbers on these shows. Steven Jack B.: This is truly grassroots back to basic stuff. I bet they’re probably going to be pretty good. Jill DeWitt: I think so too. I hope the one that we did, was it last week or a week … I can’t remember. I think it was last week where someone put in, I have to say, I went and looked at it. It was one of the shows that I took, it was, what was it, how to get sellers to love you or want to sell to you? Steven Jack B.: Yeah, that got great numbers. Did you see the numbers on that? Steven Jack B.: Put it on a T-shirt. Jill DeWitt: Yeah. That was really cool so, thank you. Wherever you’re watching or wherever you’re listening, please rate us there and hey, I love the epic stuff. Steven Jack B.: We are Steve and Jill. Jill DeWitt: We are Steve and Jill. Steven Jack B.: To buy undervalued property.